When talking about Visegrad region, we usually focus on politics. There is not much dialogue about culture or arts. Yes, we share much of our cultural heritage and history and you can easily see a lot of similarities. But when asked about the most interesting contemporary art, design or architects emerging from these countries, can we name any? This is why we as organisers of PechaKucha Night in Bratislava, Brno, Warsaw and Budapest decided to create a network of mutual cooperation and promotion. Since spring 2017 we have been working together to give spotlight to some of the most exciting artists and projects in our region. We also discussed characteristics of our local scenes as we experience them first-hand as PechaKucha organizers, running local PKN platforms. As PechaKucha organizers, we present at least 48 creatives every year to our local audiences. From this experience, we see our cultural landscape as exciting, innovative and addressing contemporary issues. Works of our presenters often deal with “search for identity”, the past and present of our region. Many cultural initiatives and centres provide services and products on high quality level, often supplementing struggling public institutions. Individual artists are great potential, comparable on a global scale. Each of our PechaKucha Night takes place in capital city, beside PechaKucha Night Brno. As an event happening in Moravia region, the organisers feel part of more of relaxed, free-spirited creative scene, which is probably less competitive, but very lively and curious environment. There are a lot of small scale, alternative venues for presentation of emerging artists. Beside Czech presenters, PechaKucha Night Brno presented Visegrad guests during their Postmodern event (3.10.). Slovak architects from Plural Studio talked about their inspiration from history in recent work. Series of documentary portraits of Slovak architects, Ikony, also presented. From Hungary, architecture studio paradigma:ariadné presented their surprising solutions to traditional cubic houses, as well as Kacper Kępiński Instytut Architektury Krakow, discussing for example how church and new public institutions have created a new architecture. Bratislava represents a bit more conservative approach, with focus mainly on presentation of visual art. 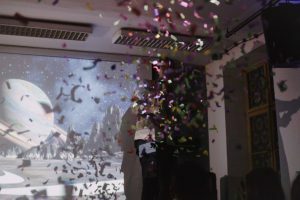 However both Brno and Bratislava are organising each PechaKucha around a curated theme, trying to showcase a wide spectrum of approaches to each topic. Local scene in Bratislava offers many interesting projects, venues and initiatives, however it can be quite divided and individualistic, which also affects young artists and their professional opportunities after graduating. In Bratislava, three events with Visegrad guests are taking place, with the next scheduled on December 6th. Back in April, with focus on people from other countries, who relocated to Visegrad region, Canadian Wendy Allan spoke about her journey to Poland, Israeli Alma Lily Rainer talked about her exhibition on sexual violence displayed in Prague, artist Alexander Tinei (from Moldova, living in Budapest) showed his work, as well as Spanish architect living in Poland, Jaime Gaztelu, and Polish architect living in Czech Republic, Szymon Rozwalka. Ágnes Jekli also spoke about their multicultural co-work-shop in Budapest. In September, Lakatlan explained how they work with communities and urban developers to revive abandoned spaces in Budapest. Lucia Kvočáková and Nora Nesvadbová from MeetFactory talked about their international residency program. Through residencies, they hope to foster an infrastructure within V4 countries. “Residency programmes in USA or Western Europe are really attractive, residencies further to East are quite exotic, but residencies within our region are quite complicated. But I think we have so much to talk about with each other, we share similar issues. Of course, we each have our own problems, but collective memory still plays a big role. We are super-complicated region, but that also makes it super-interesting,” says Lucia. “As Visegrad, we really need to work on our confidence and identity,” Nina adds. They feel that Visegrad cooperation and International Visegrad Fund are really crucial, especially in situations like they have in Hungary at the moment, when the state stopped financing NGOs and independent art. Zuzana and Marcin from PechaKucha Night Warsaw see their scene as a very dynamic, with a lot of competition. There is also a big start-up scene and a growth of creative industry. A lot of networking happens in design markets, various meet ups, creative hubs etc. When creating the lineup, the organisers use open calls and select speakers for each event from received tips. They will present artists from Visegrad region as part of their Visegrad Guest Edition scheduled in January 2018, including Adam Berka, Katharina Rothers and 4AM Collective from Brno. Similarly, Budapest also has a flourishing creative scene. What PechaKucha organisers see as a area for improvement, for the scene to be more recognized, is PR and communication beyond individual “social bubbles”. It is also difficult for young artists to pursue their careers after finishing school. 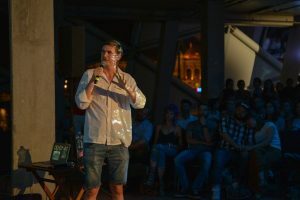 During their PechaKucha event in September, Czech multimedia artist Jiří Suchánek and Polish visual artist Marta Kopyt presented. Ekaterina Kochergina (originally from Russia, but studying in Slovakia) showed her research on various associations that people connect with countries in Danube region. Forming our V4 PechaKucha network, we aspire to provide a platform for local creatives to be more recognized within our V4 region and further. PechaKucha Night goes beyond digital connections and enables the networking of creative individuals in person and in real time. Our events are opportunities to established and emerging artists to regularly meet, discuss and share with each other and the public. You can follow inspiring artists from Visegrad region by liking our Facebook Pages – Bratislava, Brno, Budapest, Warsaw – or singing up for PKN Bratislava newsletter.